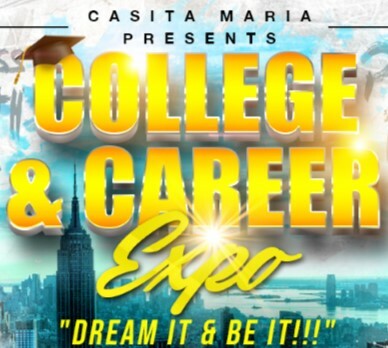 Join us at the College & Career Expo! Register Today! You Are The First In Your Family To Attend College: The Expo was designed to provide guidance and financial assistance to minority students from underserved and underrepresented communities. You Want Practical Advice About College Applications, Financial Aid, & Future Career Paths: The Expo offers seminars during the event to help high school students learn more about college and potential careers. If You Want To Talk To Admissions Representatives: The College Expo will inform you about what you need to know about admissions. Free and open to the public. Free food & raffles. The building is wheelchair accessible. Únase a nosotros en College & Career Expo! Usted es el primero en su familia en asistir a la universidad: la Expo se diseñó para brindar orientación y asistencia financiera a los estudiantes pertenecientes a minorías de las comunidades marginadas o insuficientemente representadas. Desea consejos prácticos sobre las solicitudes para la universidad, la ayuda financiera y las trayectorias profesionales futuras: La Expo ofrece seminarios durante el evento para ayudar a los estudiantes de secundaria a aprender más sobre la universidad y las carreras potenciales. Si desea hablar con representantes de admisiones: The College Expo le informará sobre lo que necesita saber sobre las admisiones. Gratis y abierto al público. Comida gratis y sorteos. El edificio es accesible para sillas de ruedas. Supported by Department of Youth & Community Development & The Charles Hayden Foundation. Smoke + Mirrors: Self-Love through the Shadows puts us in vulnerable positions as we journey to face our shadows and shift our self-talk.